They Met at a Candy Shop and Stayed Together for Fifty Years! Regina Dubala was born on March 24, 1923 in Chicago to Lew Wojciechowski and Stefania Mazur, both Polish immigrants. Regina does not remember what type of work her father did, but she does remember that her grandfather was a lawyer back in Poland. Her mother cared for their four children: Casper, Regina, Albert and Lucy. Regina went to school until the eighth grade and then got a job in a linen supply company as a stocker. She worked there for five years until she was eighteen years old. At that time, she met a young man by the name of Frank Dubala, three years her senior, at a neighborhood candy shop. Regina was in the habit of stopping at the candy shop from time to time on her way home from work. Regina says now that she never noticed Frank and his friends, who went there frequently, but Frank often later told the story of how he fell in love with Regina at first sight and vowed that she was the girl he was going to marry. He confided this to his friends, who found it enormously funny, considering that the two of them hadn’t actually met. Eventually, however, Frank worked up his courage and asked her out and was shocked when Regina agreed. Regina claims that she had no idea he was interested in her until he asked her out. The two of them hit it off right away, however, and, as Frank predicted, they married within six months. When Frank finally returned home, he and Regina had to get to know each other all over again, and Frank had to get to know his little boy. They eventually got a small apartment on Devon Avenue, and Frank found work as a truck driver. Regina, meanwhile, had another baby, Lois. Regina and Frank apparently had a very good marriage. They enjoyed going to bars to meet up with Frank’s friends from the service, where they would joke around and talk about their days in the war. They also liked to play cards with friends, garden and dance. They never traveled at all. 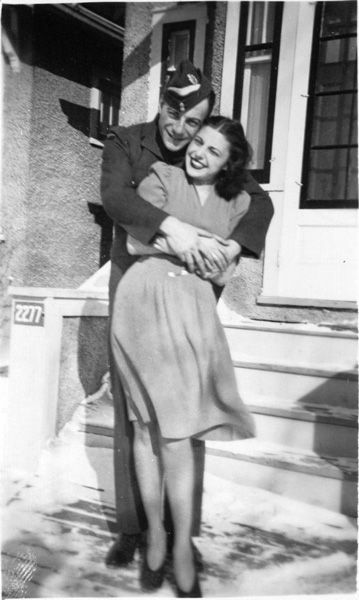 Regina said she had no desire to leave home, and Frank, she says, always claimed that he had seen enough of the world during the war. They very much enjoyed their three grandchildren and often took care of them. Sadly, in 1990, Frank passed away of liver cirrhosis. He and Regina had been together for fifty years. Regina remained on her own for the next four years until she happened to fall, breaking three vertebrae. After her hospitalization, she was unable to go back to the apartment she had shared all those years with Frank and somewhat reluctantly went to live with Lois. Regina eventually adjusted to her new home, however, but then suffered a stroke. She was again hospitalized, and this time, the hospital discharge staff recommended a nursing home for Regina. After much agonizing debate between Lois and Ed, it was decided that their mother would be placed in a home. Regina says she understands that she can no longer live with Lois, though she wishes she could. Her left side is partially paralyzed, but she is able to communicate, though her speech is slurred, and can participate in many of the home’s activities. She is in relatively good spirits and is trying to make the best of her situation. “What else can I do?” she says. Lois and Ed visit often, which seems to really cheer her. Regina is shy around most of the residents, but she seems to be making friends with her roommate. She will attend various programs if assisted. What a wonderful story. My husband and I are reading your Henrietta and Inspector Howard novels. We love your writing. I’ve just pre-ordered your new book to be published this coming April. Many thanks and be well. Hi, Sarah! Thanks so much for reading these stories – they’re great, aren’t they? And thanks so much for reading my books!!! I’m thrilled that you and your husband (both!) are enjoying them. It really makes my day, no – my week! And thanks for the pre-order…not long now! Cheers!